Choose The Right Electric Plan in Falfurrias, Texas! We work hard to earn the business of over four million customers every day, and Direct Energy will continue to lead energy innovation through connected experiences that make a difference in people's lives. Don't worry about our size. We may be one of the largest residential energy retailers in North America, but we provide big-business know-how without abandoning the dedication you'd expect from a neighborhood energy provider. Direct Energy is a resource you can rely on, no matter what you need. We have plenty of specialized offerings across the United States and Canada for you to choose from. Feel empowered to track, understand and control your electricity use with our simple tools. The ideal Falfurrias energy plan is waiting for you! In the Lone Star State, there are so many things to do besides thinking about your electricity, like curling up with a good book! Lock in competitive electricity rates from Direct Energy today! We offer excellent customer service and as your Falfurrias electric company, we're here to help power your home and make life easier! Direct Energy eases your mind during the long and hot summers in Falfurrias. We have the products and prices that are right for you because you shouldn't have to worry about your electricity bill. There is a wide range of plans available to you, from green energy to a fixed rate, where you can lock in a stable price for the contract length of your choice. With us, you can always count on competitive pricing and exceptional customer service, but the benefits don't stop there. Better understand your monthly energy bill by logging into our Online Account Manager. View your bills, refer a friend, and more - right from your computer or smartphone! Want to be more energy-savvy and save on your electricity bill? We offer the knowledge and tools to help you accomplish your goal. Learn some money-saving tips about energy in Texas by visiting our Learning Center. You have the freedom to choose your electricity provider, so why not choose the company that awards you with the tools and technology to Live Brighter? Direct Your Energy, our easy-to-navigate usage insights tool, inspects your energy usage, helping you make knowledgeable decisions that can encourage you to use less. 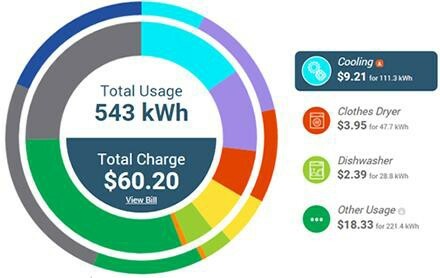 Dynamic Usage Graphs provide you with the option to view your energy usage by day, week, month, or year. Temperatures are overlaid with the usage to provide clarity on your consumption. If you want to learn more about your energy use, you can browse through Direct Energy's Learning Center and blog for access to copious resources. We have tips that range from green living and home improvement to safety tips. With Direct Energy's commitment to our customers, you can learn to better understand and manage your energy use and care for your home. Are you changing Falfurrias electricity providers? Or maybe you need new service? Direct Energy makes it easy, so if you've been researching TXU Energy, or other electricity providers such as Reliant Energy or Green Mountain Energy, look no further. We have a plan for everyone, from the freedom of a connected home bundle to the stability of a fixed rate and everything in between. Then, sign up for Auto Pay and Paperless Billing to make paying your bill even easier. It can all be done from our easy-to-use Online Account Manager! No matter which electricity plan you choose for your Falfurrias home, you can count on fixed rates and great customer service. Use our library of resources and energy insights tools, Direct Your Energy, to manage and understand your energy usage. We want to help you save money on your electric bill. By simply signing up for and participating in the Reduce Your Use Rewards program, you could get a 10% discount on your next bill! Direct Energy has everything you need to live smarter, so don't waste any time. Sign up today!